There’s no better time to set up a virtual shop. With the plethora of self-service tools and services out there, anyone can start an e-commerce store with minimal funding. You don’t even need extensive web development skills to launch a professional-looking site. Thanks to pre-made templates, cloud-based apps, and design tutorials, there are endless ways to overcome knowledge gaps and construct your virtual storefront. What you can’t attain overnight, however, are the skills needed to effectively market your brand and win customers. If you’re concerned about that, then don’t worry — we got you covered. In this guide, we’ll discuss four steps that will help you learn and apply the skills you need to thrive in this industry. The first rule of digital marketing is to know your limits. 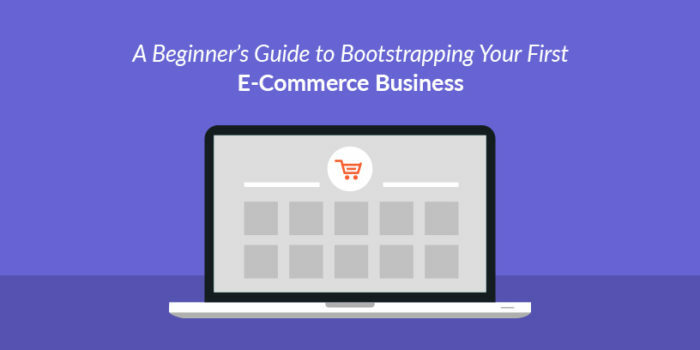 Since you’re reading a post on how to bootstrap an e-commerce business, chances are you have neither the resources nor the experience to compete against established e-commerce brands. Remember, you also have to outshine hundreds, if not thousands, of competitors who believe they have what it takes to make a dent in the industry. This is just one of the drawbacks of an industry where the barriers to entry are pretty much non-existent. That’s why you need to pick your niche carefully. Forget about mainstream niches like weight loss, dating, pets, and self-improvement — you need to dig deeper and find narrower areas of interest within these markets. 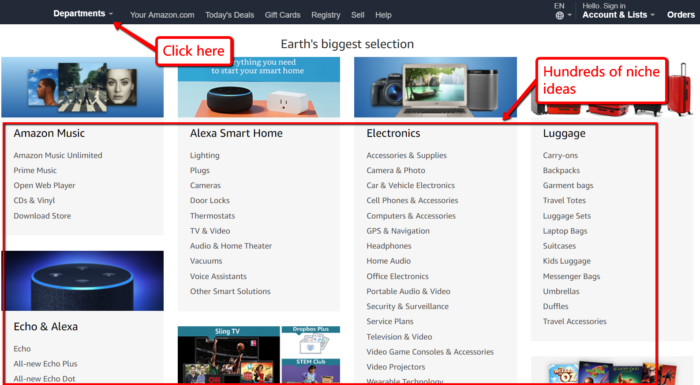 A great place to start would be large e-commerce websites like Amazon. All you need to do is click on the “Departments” drop-down menu button and wait for the page to reload. Ideally, you can find a small niche that aligns with your personal fields of interest. You’ll then have to verify the feasibility of this niche later using a keyword research tool. 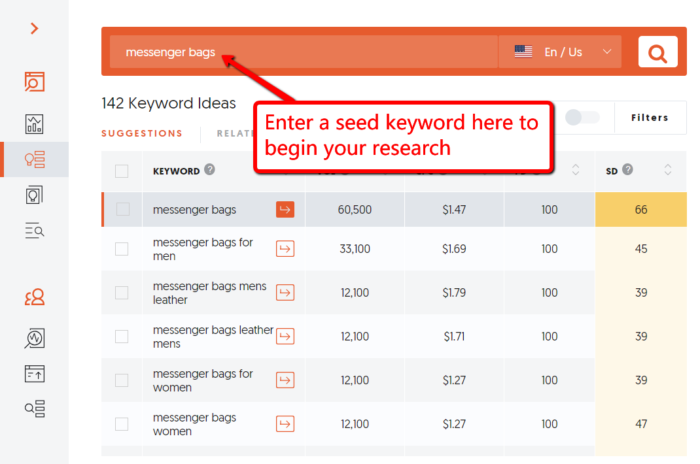 We will tackle keyword research and how it can help small e-commerce businesses later. For now, let’s get your website up and running. Let’s get one thing clear — you probably won’t have any difficulties designing your online store regardless of the e-commerce platform you choose. Most e-commerce platforms and website builders have implemented drag-and-drop functionalities that basically eliminates the learning curve of web design. However, as the future website owner, you have the responsibility to choose whether to go for a fully hosted or self-hosted e-commerce website. In case you’re unaware, fully hosted e-commerce involve comprehensive services that often come with a subscription-based pricing model. These are platforms that will hold your hand through every step of setting up your e-commerce site — from domain registration to product management. Self-hosted solutions, on the other hand, allow you to piece together your e-commerce ecosystem yourself. You need to register your own domain, pay for hosting, and integrate the functionalities you need in your online store one by one. As a small startup, going with the self-hosted approach is more sustainable since there are no monthly fees that will pressure you to get sales. Besides, setting up your own e-commerce website yourself isn’t as hard as you think. A successful WordPress e-commerce, for example, can be achieved with plugins, themes, and integrations that let you incorporate the functionalities you need into your site. This includes payment gateways, shopping cart plugins, message boards, or anything that can enrich the experience of your would-be customers. Once you have the barebones of a full-fledged online store, it’s time to shift your focus to your website’s content. Keep in mind that most of your potential customers are highly unlikely to complete a purchase on their first visit. Oftentimes, they need more information that will encourage them to trust your brand and consider choosing your products over alternatives. That’s why you need a content marketing strategy that focuses on information your target audience cares about. In addition to engaging visitors and converting them into brand followers or paying customers, high-quality content will also help your website become more visible on search engines — thus, allowing your online store to generate a steady stream of traffic over time. 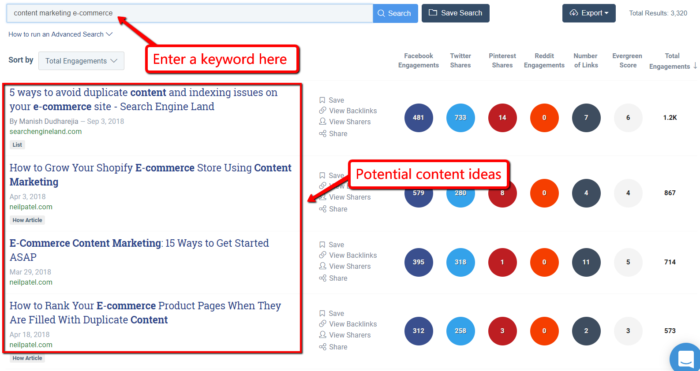 To craft a content marketing strategy, you can start with a content research tool like BuzzSumo. This allows you to comb through the whole internet with a single keyword to find popular content you can use as inspiration. Lastly, content marketing is never complete without a distribution strategy. The bread and butter of the industry as it stands is to promote your content on social media. This will give your e-commerce website a quick boost in traffic. 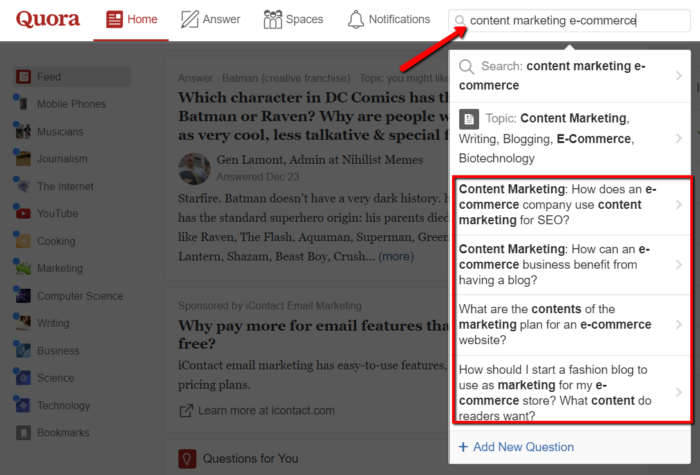 You can also take advantage of Q&A websites like Quora to promote your content to users who are specifically looking for them. Just like content research tools, all you need to do is use a keyword to find the posts you can leverage for exposure. And yes — feel free to use Quora posts as future content topics. Speaking of content research, it’s imperative that you target the right keywords to make sure you pull in the right audience. A keyword research tool like Ubersuggest is perhaps the simplest tool you can use to find these keywords. It works by generating hundreds of keyword variations and presenting metrics that let you gauge their profitability, including the average monthly traffic they garner and their competitiveness rating. For new e-commerce brands, try to look for commercial keywords with an SEO difficulty of around 30 to 40 tops. These ratings are indicative of low-medium competition, which means even new players have a shot of snagging one of the top positions in search engine results. Notice that, on some occasions, the keyword suggestions on Ubersuggest can also be used to fuel your content ideas. 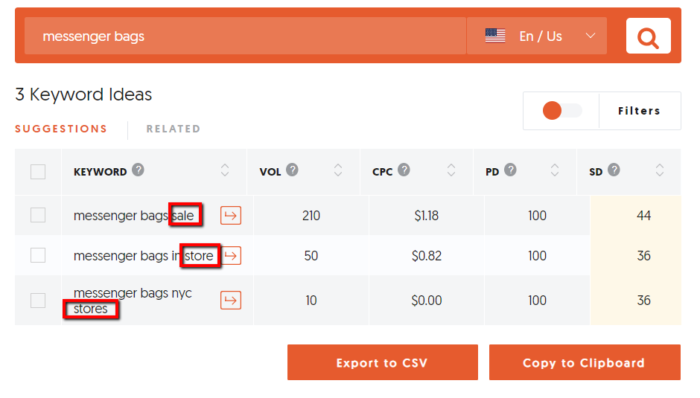 Use these long-tail keyword variations to find new content topics that no one has covered before. Nothing about starting an e-commerce business is meant to be easy. Although the strategies above will help you attain significant growth. However, you need to keep at it and have a ton of patience before you can really become a contender in your niche. If you have other suggestions, questions, or comments regarding what you’ve read, feel free to leave a comment below. Good luck! Next Post PublisherPick Review – What makes it different? On bootstrapping in e-commerce business. I totally agree with this article.